Found in FNA Volume 21. Treatment on page 15. Mentioned on page 11, 18. Annuals, 10–60(–150+) cm. Stems erect. Leaves opposite (proximal) and alternate; petioles 25–35(–60+) mm; blades deltate to lanceolate or elliptic, 25–55(–90+) × 20–30(–50+) mm, 1–2-pinnately lobed, bases cuneate, ultimate margins entire or toothed, abaxial faces sparsely pilosulous to strigillose, adaxial faces strigillose, both gland-dotted. Pistillate heads clustered, proximal to staminates; florets 1. Staminate heads: peduncles 0.5–1.5 mm; involucres shallowly cup-shaped (usually without black nerves), 2–3+ mm diam., glabrous or hispid to pilosulous; florets 12–20+. Burs: bodies ± globose to pyriform, 2–3 mm, ± pilosulous, spines or tubercles 3–5+, near middles or distal, ± conic to acerose, 0.1–0.5+ mm, tips straight. 2n = 34, 36. Alta., B.C., Man., N.B., Nfld. and Labr. (Nfld. ), N.W.T., N.S., Ont., P.E.I., Que., Sask., Ala., Alaska, Ariz., Ark., Calif., Colo., Conn., Del., D.C., Fla., Ga., Idaho, Ill., Ind., Iowa, Kans., Ky., La., Maine, Md., Mass., Mich., Minn., Miss., Mo., Mont., Nebr., Nev., N.H., N.J., N.Mex., N.Y., N.C., N.Dak., Ohio, Okla., Oreg., Pa., R.I., S.C., S.Dak., Tenn., Tex., Utah, Vt., Va., Wash., W.Va., Wis., Wyo. 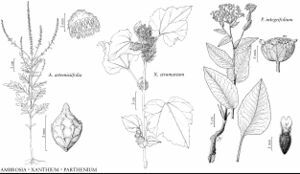 Hybrids between Ambrosia artemisiifolia and A. psilostachya have been called A. ×intergradiens W. H. Wagner. The name Ambrosia ×helenae Rouleau applies to hybrids between A. artemisiifolia and A. trifida.